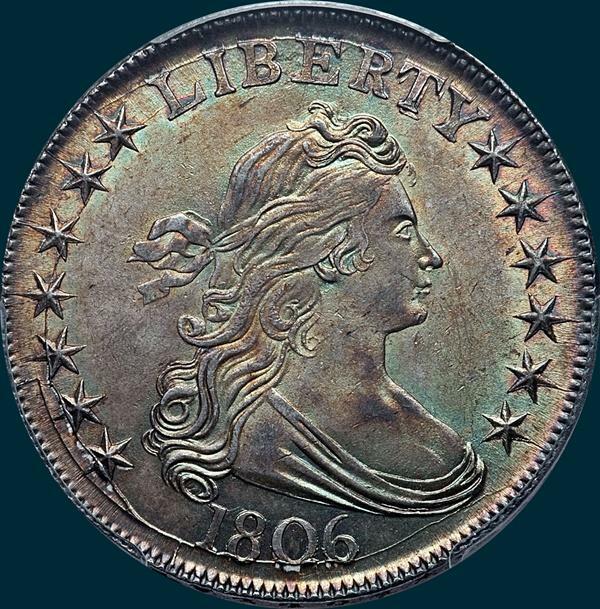 There is also a prime die state with no cracks on the reverse which is considered R7. There are a handful of high grade examples including 3 MS65's. This die marriage seems like it may be more common than R3. Variety Attribution: Obverse-Stars are large with sharp points. S7 is 1 1/4 mm. from base of L. Star 8 is slightly over 1/2 mm. from top of Y. Date large, a close 8 mm. and high, 1 nearly touches curl. T is broadly recut, with serifs, stand and base of first T showing clearly. Y shows recutting only along left side in this marriage, and not at top. There is a center dot in hair below and to left of ear.there is a crack a crack at base of date and left through several stars. this crack becomes sharper, branching into two cracks at left.In the later stages with the progressive breaking of the die small lumps develop at bottom of 806 and at stars 1 and 2. the crack gradually extends to right of date and to left through all stars. A new crack appears at top of LIBER. Reverse-5 berries and the lowest one has no stem and is centered under last A in AMERICA. he upper two berries have heavy stems joined at base. A star point is joined to tip of beak. Right base of F missing. Point of leaf under I just left of center. 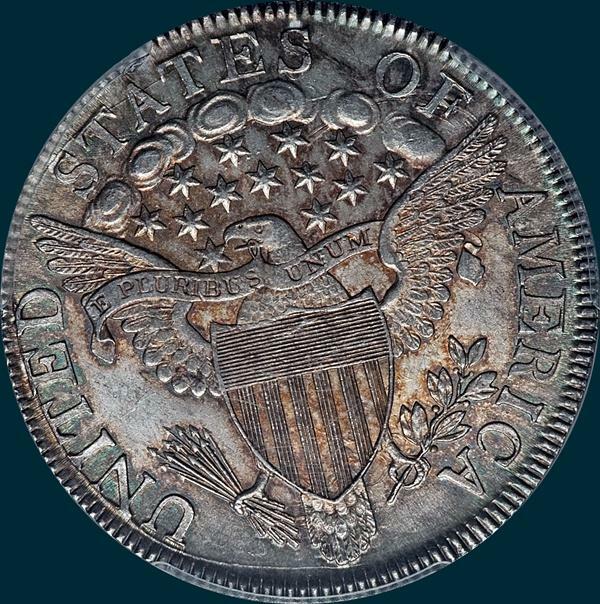 A die crack crosses lower tip of eagle's tail feathers and circles to left joining top of UNITED, then above S and through upepr part of TATE on later die states. There are also a few (R7?) examples that do not have any reverse die cracks.